Planning for winter sports is important and your smartphone can help in a surprising variety of ways. We used to rely on TV and radio reports for winter weather forecasts and alerts, but apps can provide more up-to-the-minute alerts and be carried with you wherever you travel. Following are 16 of the BEST SKI APPS FOR WINTER SPORTS 2018. Jollyturns Ski & Snowboarding App is an all encompassing effort the blends detailed resort maps, personal riding statistic tracking and social sharing. It is also available for the Apple Watch giving it greater accessibility when on the slopes. Users can see at a glance the day’s statistics and who is on the mountain. Once downloaded you don’t need network connectivity for the app to work which is important in weak signal areas. The only function that requires a network connection is the friend finder function. 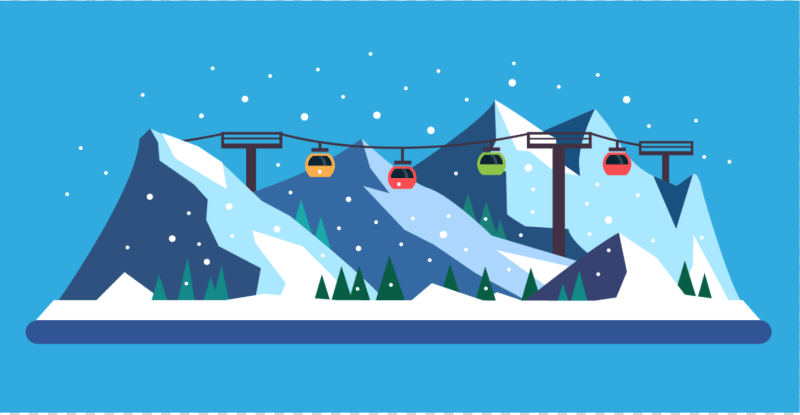 Data for almost 2600 ski resorts across the globe is available depending on the in-app purchase plan you pay for. One credit for a ski resort of your choice is included, so you can try out the application. Beyond a single resort, users can opt for one of the three additional pricing packages: one resort of their choosing for $0.99, a package of five ski resorts of their own choosing for $3.99, or all the ski resorts in the world for $9.99. Ski Tracks is a popular tracking and logging app that uses your phone’s GPS and other sensors to record your ski sessions. The app collects a variety of data including max and average speed, total distance traveled and even the angle of the slope. All metrics can then be logged, organized into different runs and plotted on a map. The app will automatically track your runs, speed, vertical, goals and achievements, and present it in beautiful charts. You can share your stats with your friends. Click on snow reports and search thousands of resorts for the latest snow and powder information, number of open trails, lifts and mountain statistics. Resorts include zoomable maps. Set goals, like vertical, or the number of runs to keep you motivated and compete with other members of the Active network. Winter Sports is built by a professional ski instructor, a Microsoftie and a startup in Silicon Valley. It is an official app of Professional Ski Instructors of America and American Association of Snowboard Instructors (PSIA-AASI). If you become stranded, the Winter Survival Kit app will help you determine your geographic location and contact emergency services. The app’s “gas calculator” will help you estimate how long you can run your engine on your remaining fuel. Winter Survival Kit also provides NDSU Extension Service information on how to put together a physical winter survival kit and prepare your vehicle for winter driving, and how to stay safe when stranded in a winter storm.Winter Survival Kit can also alert you to check your car exhaust pipe for snow buildup and automatically message an emergency contact. It has a section for storing emergency phone numbers and data like your AAA membership details. OnTheSnow.com fields a neat snow conditions app for Android and iOS devices called Ski & Snow Report. The app brings users current conditions and snow reports from over 2,000 ski areas, resorts and courses worldwide, as well as crowd-sourced condition reports and powder notifications for when your favorite courses receive fresh snow. OnTheSnow Ski & Snow Report also comes with a wealth of extras, such as trail maps, resort details and reviews, skiing news, and information on the latest discounts and gear. One great snow resort app packed with data is OnTheSnow Ski & Snow Report, free on iOS and Android. Use it to search for resorts nearby or for detailed information about snow and weather conditions and how many ski lifts are open at your favorite resorts. While it’s easy to use, its main drawback is that it has pop-up ads. High quality video lessons that will guide you from your first time on snow right through to introducing a parallel turn. Looking at the equipment, straight runs, snowplough, turning and more. Stunning video, intuitive cue cards and engaging presentation will enhance your learning experience and give you the skills to feel confident and in control. These carefully designed lessons willomplement on-slope tuition with a qualified instructor. If you have a GoPro camera, this app is the fastest way to share short video clips directly to social media channel. It’s a quick and easy way to create and share short videos directly from your GoPro camera to Instagram and Facebook, plus you can use it to control the camera remotely to capture the shots you want and share them with friends. Knowing where the dangers lurk when exploring off piste can be the best part of snowsports trip. This app lets users download the most recent avalanche forecasts for a ski area, review conditions recently reported by other users, easily collect information about snow, weather and terrain conditions, and receive warnings when there’s a high avalanche risk. Ullr Labs’ Mobile Avalanche Safety Tools (MAST) combines iPhone technology with established snow science to improve winter backcountry travel decisions, make it easy to share observations and adventures, and provide ongoing resources to increase avalanche knowledge and awareness. Trace Snow (formerly known as Alpine Replay) is a fantastic course-and-trail-tracking app that lets skiers log an entire day up in the slopes. Using your phone’s built in sensors, Trace Snow records metrics such as speed, jumps, airtime, distance traveled and calories burned. Users can view a summary of their statistics after hitting the slopes, with their route automatically mapped out. Trace Snow is the premier ski and snowboard tracking app and is ranked as the #1 winter sports app by Men’s Health magazine. Trace Snow is the most used and highest rated app in the world–our users log more than 2 billion feet of vertical a month! Track your day on the mountain with Trace Snow by measuring speed, distance, vertical, Calories and more. Made by skiers and snowboarders for skiers and snowboarders. We automatically separate your runs, tell you which chair lifts you’ve taken, clock your time on the chairlift and much more! Zumobi’s Ski and Snow Report app allows users to look up fresh information on snow and weather data for your favorite ski resorts and destinations. It alerts you to fresh powder at your fav resorts and has info on the slopes and lifts open. The app provides access to five-day weather forecasts, resort details, detailed stats such as snow depths and useful extras like trail maps. The Zumobi Ski & Snow Report is freshly redesigned for the 2015 ski and snowboard season with all the critical snow and weather data you need to get the jump on the dumps at your favorite resorts. Add your favorite ski and snowboard destinations to get notifications for up to the minute snow and weather conditions delivered live to the easy to navigate app. Resort detail pages provides snow depth data including base and top, a five day forecast, instant access to Twitter feeds, live webcams, trail and lift maps, and more so you do not get left out in the cold. Planning an excursion with friends? Social sharing features let you drum up a caravan to the slopes via Facebook or Twitter at the touch of a button. Liftopia gives usIAers access to thousands of deals when it comes to pre-booked lift tickets, ski and snowboard lessons, equipment rentals and other winter-sports-related purchases. Low prices are combined with easy in-app booking, letting you plan your skiing vacation stress-free. Extra features include the ability to save your favorite ski resorts and courses for quickly pulling up relevant deals, as well as updated snow condition information for your go-to ski spots. If you have a flexible schedule and pay attention, Liftopia will get you the best rates on the mountain. SkiFit8 offers a great workout plan to help with getting in shape before a winter holiday, led by physiotherapist and clinical expert Neil Maclean-Martin. The set of exercises can be done anywhere in just eight minutes, and workouts are suitable for all. A short intense video based training programme for all levels of skier. Developed and tested in Chamonix by the clinical specialists at La Clinique du Sport, SkiFit8 provides an exercise programme ideal for the the busy skiing enthusiast. This workout is designed to be done in the home or in the gym and require no specialist equipment. The 8 minute workout which includes strength, endurance, core, balance and coordination exercises to develop all round fitness for skiing. Improve your skiing performance, protect yourself against injury, develop correct movement patterns, strength, endurance, balance and coordination with SkiFit8. Fatmap is a 3D ski mapping app, using high-resolution satellite imagery to offer features never before included on a humble piste map. Skiers and snowboarders can negotiate their way around popular ski areas in a high level of detail, moving around a 3D world using GPS-enabled navigation, viewing the slopes from any angle and perspective. Two types of Fatmap are available for each ski resort – a basic piste version and a more expensive and detailed free-ride version. This app is expensive but maybe the most detailed at what it does. You will need to purchase a different map for each resort area. With a slick design and plenty of nifty features, Edge Ski was called one of Apple’s ‘Best New Apps. It uses your phone’s GPS to plot your route down the mountain, giving you a whole load of piste maps too so you can dispose of those pesky paper versions. A speedometer lets you know how fast you’re going, keeping a track of previous times and letting you compare head to head with your friends in a leaderboard. To avoid any enormous roaming charges when you get home, the app can also download all map and weather info from your resort for offline viewing. Safety is key when you are off skiing, particularly if you veer off course. This where ALERT SOUND 5 can help to send out a message if you find yourself in distress. Customizable options like an emergency contact can be instantly dialled, while a separate alert will automatically be sent out after a period of inactivity.